Where did it come from? From Atria Books for review. Why do I have it? I was blown away by Palma’s first book, The Map of Time, last summer, so of course I was interested in reading more of his work. How long has it been on my TBR pile? Since 27 August 2012.
stars: they’re not just from H. G.
Summary: H.G. Wells is quite a successful author, who is able to capture the world’s imagination like no other, but after the debacle following his publication of The Time Machine, he’s rather sensitive to other people capitalizing on his ideas. So he’s not best pleased when the American author of an unworthy (and unauthorized!) sequel to his latest novel, The War of the Worlds, asks him to meet. But Wells barely has a chance to properly chastise the man before he reveals something incredible: aliens are not fiction, but real, and there is in fact an alien corpse hidden in a secret chamber beneath the British Museum. Wells is at first inclined to disbelieve, but when events from his novel begin to come true, he is left with no choice but to accept than aliens are real – and to fight against their invasion of Earth however he can. Review: This one was a bit of a disappointment, I’m terribly sad to say. Not that it was bad, far from it; taken on its own merits, The Map of the Sky is good-to-very-good, with some parts that I absolutely loved, and overall just beautifully written (and translated, to give credit where credit is due). 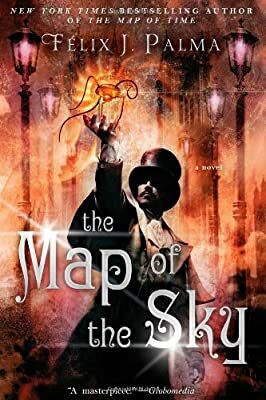 But I was completely blown away by this book’s predecessor, The Map of Time, so I went in expecting and hoping for more of the same magic, but unfortunately, The Map of the Sky didn’t quite live up to it. One of the things I loved most about The Map of Time was how it took three totally disparate stories, and tossed you from one to the other without regard for narrative convention, but then at the end brought them all together in a way that was so perfect and complete that it took my breath away. Palma attempts to duplicate that same structure in The Map of the Sky, but it doesn’t work as well. The pieces are enjoyable on their own – in particular, I thought the first section, with the discovery of the alien by a team of Antarctic explorers was fantastic, and just wonderfully creepy and claustrophobic and suspenseful. But the various pieces don’t seem to tie together as smoothly as I wanted, and there weren’t the kinds of twists and turns that made you reconsider everything that had come before. (Although perhaps because I knew something of what to expect from the story structure, I was more on the lookout for plot twists?) In any case, while the ending did a credible job connecting the various story lines, it was just somehow lacking that spark that knocked my socks off in the first book. Another reason that this book fell a little short of my expectations is probably entirely idiosyncratic: namely, it turns out that I like time-travel sci-fi more than I like alien invasion sci-fi. That’s entirely a personal preference, but something about time travel stories captures my imagination in a way that aliens just don’t. So for that reason, I found a substantial chunk of this book, in which the aliens actually are invading Earth, to be less compelling than it could or should have been. But, even with all that being said, I still definitely enjoyed the book. (Not as much as I enjoyed the first one, but that is admittedly a very high bar to clear.) These books are just so original, interestingly written, and full of a bunch of neat ideas and exciting action scenes, that it’s hard to even compare them to anything else. But worth reading, however they’re categorized. 4 out of 5 stars. Other Reviews: Devourer of Books, Minding Spot, The Speculative Scotsman, and more at the Book Blogs Search Engine. First Line: Herbert George Wells would have preferred to live in a fairer, more considerate world, a world where a kind of artistic code prevented people from exploiting others’ ideas for their own gain, one where the so-called talent of those wretches who had the effrontery to do so would dry up overnight, condemning them to a life of drudgery like ordinary men. p. 38: “The enormous whaler had formerly been used to hunt sperm and yubarta whales in the South Atlantic Ocean.” – Spanish term for humpback whales. Not sure why this wasn’t translated (they’re not talking about a Spanish ship, for example). I think I may have liked this one a little better than you did but I do have to agree with you on one part and I think it’s the time travel aspect. I hadn’t thought of it before but now that you say it, I think you’re right. Time travel is much more interesting than alien invasion. I enjoyed The Map of Time immensely but I never got to that level of enjoyment with The Map of the Sky. The first part of the book was fantastic and the rest, while I still liked it, didn’t have the same excitement which I was expecting. You’re right, The Map of Time is hard to live up to. In the end, Palma’s an author I’ve been happy to discover. Amy – I may have come off a little more negative in my review than I really meant… it’s just that I loved The Map of Time SO MUCH that I wanted to dissect why this one didn’t work as well. But you’re right, Palma’s a great find, and I will absolutely read his next book. I actually liked this one better. I thought Palma went off on fewer long tangents. Of course, it might be because I was expecting those tangents. And the way that the Arctic expedition came back around made me almost shout with glee, because I’d forgotten what Palma did there and it tied back together so nicely. DoB – I actually liked the long tangents, especially when they fit into the “main” story in ways I wasn’t expecting. I really need to read this trilogy. I have had the first book out from the library, but didn’t get a chance to read it. Kailana – Get it when you’re in the mood; they’re books that require a fair bit of attention from the reader. I got The Map of Time audiobook from the library, but haven’t started it yet. Laurie – Lucky you! I wish I could read it again for the first time.